The original Addiction was released in 2007 and over 10,000 of them have since been sold! The new Addiction XL features total wing area of 1,055 square inches, in a 59.5 inch wingspan model. 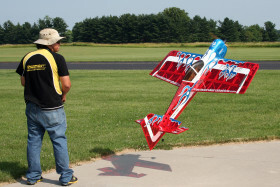 Capable of impressive precision aerobatics and 3D flight, it maneuvers with the feel of a 150cc airplane. The Addiction XL is built using the finest grade material, all cut by state-of-the-art laser and CNC machines and utilizes the very latest PA FiberFusion building techniques. The end result is an incredibly lightweight yet rigid airframe . Previous Team Futaba’s Kurt Koelling, 2013 Scale Aerobatics National Champion!